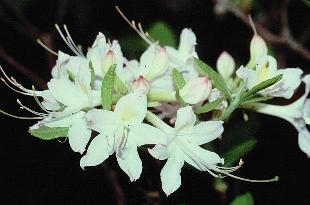 Rhododendron alabamense, Alabama Native Azalea. White blooms on a deciduous native wild American species rhododendron shrub. Price includes delivery. Blooms: White fragrant blooms in mid-Spring. Mature Size: 3-5 feet tall. Origin: Southeastern United States, East Alabama. Very rare. Difficult to find in the wild.